Register Now and select the option that includes the workshop pass. Parks Associates’ Senior Director of Research, Brett Sappington, provides an overview of the pay-TV landscape and examines how the increasing availability of alternative paid video options has driven a decline in pay-TV subscribers. This isn’t your father’s pay-TV marketplace. Competitors, partners, and distribution channels are evolving, forcing a re-examination of everything from branding to service offerings to roles within the industry. This research presentation outlines the new ecosystem for video services and the trends shaping the landscape for video. In today’s video service arena, data is a critical element for success. Companies like Netflix, Google, Amazon, and Facebook are accustomed to using data to shape their services and user experiences. In this session, industry leaders will examine the competitive advantages available through use of viewer data and how pay TV must change to achieve success in a data-driven world. Over the past three years, hundreds of OTT video services entered the market, offering consumers new choices in original content, business models, and user experiences. This research presentation will examine the successes and struggles among OTT video services, outlining the key learnings that today’s video services are leveraging to better attract and retain users. Understanding the perceptions, values, content consumption, and spending of young consumers will be important for future video service success. This research presentation will examine the behavior and attitudes of young consumers, including the video services and experiences that best capture their interest. Technology and service innovations continue to reshape user experiences and redefine video services. This panel of industry leaders examines the innovations that will fuel the next generation of video services and how today’s operators and content producers can best prepare for the road ahead. 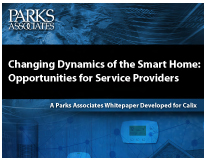 Parks Associates’ pay-TV research team provides top takeaways and recommendations for service providers navigating the changes in the pay-TV industry. Kristin Dolan is Founder and Chief Executive Officer of 605. She founded 605 in November 2016, bringing more than 30 years of media and entertainment experience to her role with the company. At 605, Kristin leads all day-to-day business operations including key client relationships, product development, sales, research, finance, legal and marketing. She is also Founder and Managing Partner of Dolan Family Ventures (DFV), as well as a member of the Board of Directors for AMC Networks, MSG Networks Inc., The Madison Square Garden Company (MSG), The Wendy’s Company and Revlon Inc. Most recently, she served as Chief Operating Officer of Cablevision Systems Corporation leading all aspects of the company’s cable operations and overseeing thousands of employees, including the company’s entire customer and field service workforce. She also oversaw Cablevision Media Sales, the company’s advertising sales division, which was widely recognized for its pioneering data strategy that paved the way for an audience-driven approach to television advertising, providing deep insights into viewership in the New York DMA (the nation’s most influential viewing market). Kristin has also previously served on the Foundation Board for SUNY Albany and the National Board for Women in Cable & Telecommunications (WICT). She received an M.A. in English literature from Long Island University, an M.S. in publishing with a concentration in marketing from Pace University and a B.A. in English from the State University of New York at Albany. Mark Jensen is the executive directory of video product management & strategy. Identifying key insights and market research for developing innovative product plans. Leading teams in developing strategic technology blueprints for evolving existing television and media systems to achive new business models. Prioir to joing ATN in 2016 he held roles within Ericsson’s global media business unit. Served as vice president of business development for the Americas and later served as advanced media architect developing cloud-based media storage and processing, hybrid and OTT strategies for operators and content companies across the LATAM region. He has an Economics degree from the School of Business, University of Southern Maine. Serves in helping people and families in need through active sporting adventures and enjoys his time backcountry camping, hiking and mountain biking with his son Kagen. Blake Sabatinelli is CEO of Newsy, the next-generation national news network. Prior to joining Newsy, Blake oversaw video strategy for the digital division at Newsy's parent company, The E.W. Scripps Company. Blake has a long history in both news and digital strategy. A native Texan, he started his career as a digital producer at ABC Action News in Tampa, and was later promoted to executive producer, managing a team of producers and overseeing editorial operations. Blake later led the digital strategy and operations at WJLA and News Channel 8 in Washington, D.C. When not at one of Newsy’s offices, you’ll find Blake at home in Cincinnati with his wife, Jinna, and his two children, Clayton and Emelia. Mea the miniature dachshund rounds out their family. Chris Thun is VP of Product at TiVo where he is responsible for consumer experience across TV, mobile, and web. His team drives the product strategy across TiVo’s client portfolio, including Linux set-top boxes, Android TV, and Streamers. As an Internet and media entrepreneur Chris was on the founding team of Fan TV, a start-up acquired by TiVo in 2014. Prior to TiVo and Fan TV, Chris built and managed some of the largest products and brands at Yahoo! and Apple. Chris holds a BA from Williams College and received his MBA from the Kellogg School of Management at Northwestern University. Clayton Wagar is Vice President of Advanced Technologies at Espial. The Espial Elevate Cloud serves as the PayTV back office for more than 40 operators in North America, and millions of consumers worldwide. In his role, he leads the technical sales and advanced technology groups, bringing new solutions to operators and representing their interests in Espial’s development efforts. Over the last two decades, Clayton has had a multifaceted career as a Service Provider vendor, including sales, product management, marketing, and engineering. He has regularly participated in standards development including IP networking, broadband architectures, and streaming media. Previously, as CTO of Cable Solutions at Alcatel-Lucent, his team designed and deployed several of the first large multiscreen initiatives in North America. He lives in Atlanta with his wife and three sons.